Over a year ago, one of my colleagues listed three boutique cigar manufacturers in an effort to “discover new sticks and to play at least a small, direct role in supporting the art of cigar making.” Today I’d like to continue that trend because, in my opinion, these smaller-scale operations turn out some terrific smokes for a fraction of name-brand prices. Now you might be asking what qualifies a cigar producer to be “boutique.” According to a 1999 feature article in Smoke Magazine, boutique cigars are “brands with a production of less than 1.5 million sticks per year.” (That number would likely have to be upped today to adjust for increased overall cigar production.) Others say boutiques simply mean the firm’s stogies are cultivated in small batches with high attention to individual detail. For our purposes—and because it’s a lot easier than researching production numbers—I’ll adopt a broad definition: Boutique cigar manufacturers are those with a relatively limited output, name recognition, and niche market. In other words, to borrow a metaphor from Smoke Magazine, they are the micro-breweries of the cigar industry. This definition is certainly subjective, so feel free to disagree with my belief that, despite José Oliva’s assertion, his operation is not boutique. Isla de Cuba. I’ve loved everything I’ve tried from Darryl Lieser’s Tampa-based boutique. The two original blends that launched in February—Classic and Aged Maduro—have a simple beauty to them, and Isla’s new Wango Tango and Blend 376 lines are also impressive. Feel free to use the comments below to share your favorite boutique cigar manufacturers with other StogieGuys.com readers. Well said. I would also add La Tradición Cubana to this list as a boutique that's worthy of your attention. I bought the Ybor City handmades based on your recommendation. Not sure if it qualifies as a boutique, but if it does it is one of my favorites. 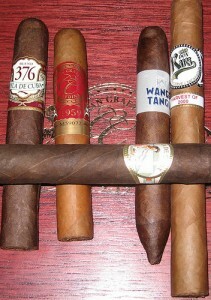 I would add the La Rosa Cubana to the list of boutique cigars. I re-submitted my inquiry to Cuban Crafters again today, and I hope to have another update soon. I am planning another Medina 1959 reivew–this time of the Torpedo vitola–to coincide with the full product launch. Don't forget about the El Tiante's which you just reviewed. The corojo's are some of the best smokes out there. Of course being from New England I guess I'm biased. UPDATE: The Medina 1959s may not currently be available on Cuban Crafters' website, but you can find them at Duque Cigars. Simply click on our sidebar link.